Have you ever preformed a simple activity like bending over to tie your shoe and suddenly felt stabbing pains in your back? Turns out 8 out of 10 people will suffer from lower back pain at some point in their lives. While modern medicine pinpoints specific causes of lower back pain —poor posture, lack of muscle tone, strain, and stress — Ayurveda sees back pain as a symptom of vata and kapha imbalances, aggravated by a build-up of ama. This helps explain why the incidence of lower back pain increases with age. Fifty percent of those over the age of 60 experience lower back pain. According to Ayurveda, when we are 60 and over we are considered to be in the vata time of life. So it makes sense that vata imbalances — and their resulting problems — appear more frequently in these years. Each of the three doshas (vata, pitta and kapha) has five subdivisions called “subdoshas” which control particular functions of the body. One of the subdoshas of vata, apana vata, is related to lower back pain. Apana vata is situated in the lower pelvic area and is responsible for the downward moving aspect of vata relating to elimination and menstruation. Chronic problems such as constipation and painful periods may indicate an underlying imbalance that can end up resulting in lower back pain later in life. When vata becomes aggravated by stress or fatigue, by traveling, by a cold, dry environment, or by too many cold, dry, rough foods, the increased vata influence in the body affects kapha. One of the subdoshas of kapha, avalambaka kapha, is located in the lower back and heart. It lubricates and supports the spine and the sacrum. This subdosha can “dry out” when affected by apana vata. When kapha does not lubricate properly the result is dryness in the joints. This can lead to pain, aches, stiffness, etc. This drying influence may also cause difficulties with elimination and constipation. Ama —toxins and impurities that accumulate in body—is another factor to be considered with lower back pain. When vata and kapha are aggravated they mix with the ama, creating either a vata-aggravated ama or a kapha-aggravated ama. The ama can become lodged in the joints, blocking joint movement and interfering with the production of fluid lubricating the joints. This leads to cracking joints, stiffness, pain, loss of cartilage and overproduced bone growth at the joints resulting in osteoarthritis. Effective preventive treatment for chronic lower back pain should include regular stretching, such as yoga exercises. The authentic, traditional Ayurveda treatments (Panchakarma) offered at The Raj specialize in removing ama and impurities that have accumulated in the joints and tissues. They also help balance vata, allowing kapha to once again function normally. If you are prone to lower back pain, try to avoid eating vata-aggravating foods such as dry foods and raw vegetables. Also avoid root foods, which not only aggravate vata but also have certain properties that can adversely affect joints. To reduce ama, avoid cheese, meat and heavy, fried, or processed foods. Eat your main meal at noon and take a lighter meal in the evening. Pacifying vata is the key to keeping everything else in balance. A simple home oil massage each morning can help soothe vata and also help remove ama from the skin tissues. Many people find that their back goes out when they are under stress. In a stressful situation the whole body can tighten, tense, and can easily go into muscle spasm, which can push vertebrae out of place. At The Raj Ayurveda Health Spa and Treatment Center, daily practice of the Transcendental Meditation technique is recommended to reduce stress, thereby reducing incidences of lower back problems. Now we can understand that while back pain may appear to be caused by some specific activity, there has in fact been a long series of events leading up to that particular moment: an aggravation of vata, a disruption of kapha’s lubricating function and a build-up of ama. The good news is that it is not just an inevitable part of growing old. It is not uncommon for parents of toddlers to stress over getting their children into top pre-schools so that they will have the best possible start in life. But according to Ayurveda, getting the best start for your child should begin months before the child is even conceived. While it has become more common for mothers-to-be to be alert to their diets and life-style before conceiving, modern science is just now catching up with the ancient wisdom of Ayurveda in encouraging both parents to take early steps in preparation for making a baby. The big news in 2013 was that what men eat — and specifically if they are eating their vegetables —seriously affects the mobility and health of their sperm and the health of their future children. In a recent Boston study, male participants who ate the most carrots had the best sperm mobility. High levels of beta-carotene, the pigment that gives carrots, sweet potatoes and pumpkins their bright color, was linked to better swimming ability of sperm. The same study found that lycopene, a bright red phytochemical found in tomatoes, red bell peppers, watermelon and papayas (but not strawberries and cherries) was linked to more properly shaped sperm. Both mobility and proper shape can affect fertility. Where can we find folic acid? Beans, peas and lentils, dark leafy greens, asparagus, broccoli, cauliflower, beets, celery, carrots, squash, okra, brussels sprouts, citrus fruits, avocado, seeds and nuts all are high in this important compound. The classic texts of Ayurveda offer a great depth of knowledge on how to properly prepare the body before pregnancy. This knowledge forms the basis of the Pre-Conception Program offered at The Raj, Ayurveda Health Spa and Treatment Center in Fairfield, IA. 1. Accumulated impurities in parents can act as obstacles to proper nourishment. Once these toxins are removed, parents-to-be are more able to respond to dietary changes, resulting in more balanced physiologies. 2. According to the Washington, D.C.-based Environmental Working Group (EWG), most infants come into this world “pre-polluted,” with over 200 toxic industrial chemicals circulating in their bodies. These findings were consistent no matter where parents lived. We are exposed to chemicals by means of our air, water, soil, and food and household products. And research has shown that the earlier in life toxic exposure occurs, the more powerfully these chemicals affect a child’s development going forward. While pre-pregnancy detox programs are becoming more and more popular, research shows that only the traditional Ayurvedic purification treatments are able to remove fat-soluble chemicals such as DDT, PCBs and dioxins. These are all hormone-mimicking chemicals known to interfere with fertility. According to Ayurveda, it takes six weeks for the entire process of digestion and formation of the bodily tissues to take place. Thus for six weeks following the detox treatments, husband and wife follow an individually prescribed organic diet that targets specific imbalances which could be passed on to their children. The diet also provides optimum nourishment to create healthy ovum and sperm. A healthy child is the result of healthy parents. By strengthening the basic material that makes a child, parents can increase the chance of bringing strong and healthy children into the world. ( Picture of pregnant woman. Source: Google Advance Image Search. Continuing our celebration of fruits and vegetables, it turns out that there is a direct correlation between a healthy diet and a healthy braIn. Days before a first-ever G-8 summit on dementia in London, leading English physicians wrote an open letter to the Health Secretary saying that the benefits of diet far outweighed “dubious drugs” in the battle against dementia. They urged that the best strategy for preventing Alzheimer’s and other memory-affecting diseases was a diet of fresh fruits and vegetables, nuts, fish and olive oil. In 2011, researchers from VA’s Puget Sound Geriatric Research, Education and Clinical Center documented an important link between diet, exercise, and the development of Alzheimers. According to lead author Laura D. Baker, PhD, for those who are aging normally, regular exercise can help offset the “potential pathological effects of a western-type diet on Alzheimer’s disease biomarkers in the brain”. But for adults who have already have an existing condition of mild cognitive impairment, improvement only came when a change in diet was added to the regular exercise routine. Switching to diet low in saturated fats and refined carbohydrates actually improved memory function. Results in Only 4 Weeks! The team found that a diet low in saturated fat and high in foods such as whole grains and vegetables could favorably alter the levels of certain markers for Alzheimer’s in only four weeks. This diet improved visual memory not just for older adults with mild levels of Alzheimer’s disease but for healthy older people too. While these studies have been small in scope, they all lead to the encouraging conclusion that we do not have to wait for a magic drug to appear on the market to protect us from dementia. Instead there are simple life-style changes that we can make today to keep our brains alert and functioning in good order. By favoring regular exercise and a diet of lean proteins, fruits, vegetables and whole grains, and by keeping sugar and refined carbohydrates to a minimum, we can reduce the risk of dementia and at the same time significantly increase our level of physical health and well being. Win/win! The past year was a banner year for fruits and vegetables. With research linking them to lowered cholesterol, improved sperm quality, increased fertility, protection from UV rays, and the prevention of anemia, dementia and cancer, fruits and vegetables are emerging as superfoods in the quest for health and longevity. There is even evidence that eating fruits and vegetables makes you more attractive. I wanted to start reviewing some the latest research on fruits and vegetables one claim at a time. And since nothing motivates like vanity, I’ll start with two studies that reached similar conclusions: the more fruits and vegetables you eat, the more attractive you are to others. Researchers in one study followed the diets of 35 participants, took pictures of them at the end of the program, and showed the pictures to others. Those participants who ate an average of 2.9 more portions of fruits and vegetables each day developed a golden tint to the skin and were rated as healthier looking. And those who downed an extra 3.3 portions daily were rated as more attractive. A similar study published in the Royal Society journal in England found that photographs of subjects whose skin color was altered through a diet rich in fruits and vegetables were rated as more attractive than those with suntans. What is the science behind the results? 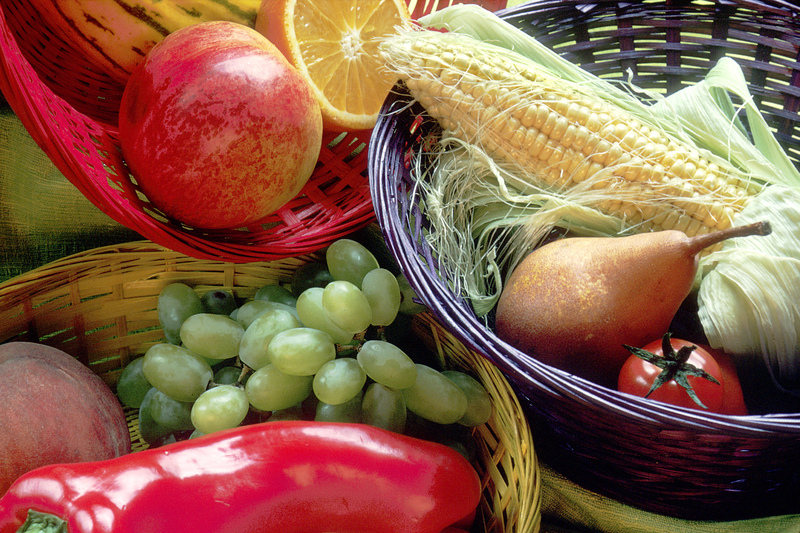 Antioxidants in fruits and vegetables improve circulation and alter skin pigment. Lycopene, a bright red carotene that gives a red color to tomatoes, watermelon and other red fruits and vegetables, and beta-carotene, found in sweet potatoes, carrots, cantaloupe broccoli, kale and other leafy greens, seemed to have the greatest role in altering skin color. Polyphenols, which increase blood flow and oxygen delivery to the skin surface, also played an important role. Polyphenols are found in fruits such as berries, grapes, apples, plums and lychees, and in vegetables such as artichokes, Brussels sprouts, and parsley. In addition to altering the tone of the skin, antioxidants also enhance skin quality by fighting the damaging effects of pollution, stress and UV rays. He went on to surmise that evolution probably favored those who choose to form alliances or mate with healthier individuals over unhealthy individuals. Thus, he concluded, we are programmed to respond to a healthy glow. Next time I’ll look at a more serious benefit of eating fruits and vegetables: their importance in preventing dementia.